Driver Training for Firefighters | Drive Team Inc. Accidents involving fire trucks have been on the rise for the past several years, according to the National Highway Traffic and Safety Administration (NHTSA). Fire trucks are often required to travel at high speeds along congested roads, sometimes facing drivers who don’t provide the right-of-way or debris blocking their way. Or, some firefighters may not understand that they, too, need to follow the rules of the road, like stopping at red lights or stop signs and driving with Due Regard. Firefighters train regularly to ensure they know how to use their gear correctly. However, they often don’t spend as much time learning proper emergency vehicle response procedures, even though the fire truck is used as frequently as any other tool or piece of equipment. This is why firefighter driver training should be a critical component to any fire department’s training program. They’ll understand the laws that apply to emergency vehicles. Every state has specific driving laws that apply to emergency response vehicles, and through a firefighter driver training program, they’ll understand all the ins and outs of these laws and regulations. They’ll learn how to properly navigate with Due Regard. When an emergency occurs, we are trained to act as quickly as possible, and this is when our training goes into effect. If firefighters are consciously training the safest way possible to operate a motor vehicle, then as the subconscious takes over and when adrenaline is pumping, the driver operates with what they know. Let’s give them the right tools to operate by and make everyone safe. They’ll get more familiar with the fire truck. Every fire truck is full of various controls, and drivers need to not only understand how everything operates, but also be comfortable with the size of the vehicle. Additionally, learning how to drive in emergency mode when the lights and sirens are activated is also key to being a safe driver. They’ll get practical, hands-on training. Not only does a comprehensive firefighter driver training program involve extensive classroom time, but attendees also get plenty of experience actually learning how to drive the vehicle correctly. Hands-on training helps them feel more comfortable in their skills when it’s time to respond to a real emergency. Remember, we can’t take care of the emergency if we never get there! DriveTeam’s mission is to raise firefighter’s skills and safety levels through classroom and hands-on driving for real world experience. 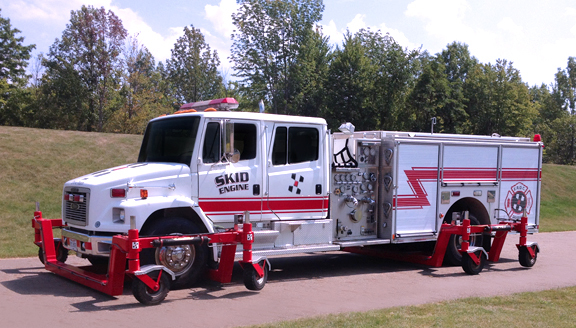 Our Emergency Response Operations Courses (E.R.O.C) are designed to train firefighters in practical, hands-on driving. Contact us today for more information.